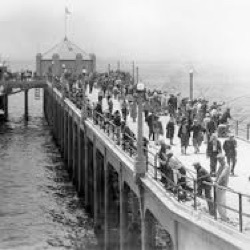 The tradition began on July 4, 1904, when Huntington Beach commemorated the arrival of the first electric passenger train linking the area with Long Beach and Los Angeles. 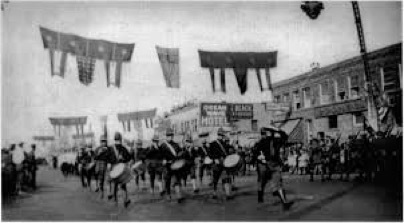 The Board of Trade, a forerunner of the Chamber of Commerce, sponsored this first event, bringing 50,000 people to town to join in the day’s celebration. Through the years, residents and visitors have witnessed some spectacular sights. How’s this for a show-stopping stunt by a city official? In the late 1930s, the city’s first lifeguard and fire chief, Dilbert “Bud” Higgins had a trick that no one has since imitated. He would don a firesuit, cover his face with petroleum jelly, soak himself with alcohol, light a match and dive in a fiery ball from a 50-foot platform high above the pier into the water below. Among the famous who have presided over the parade in years past are Hollywood movie stars Jayne Mansfield, Natalie Wood, Zsa Zsa Gabor, Dorothy Lamour, Mickey Rooney (and Mickey Mouse!) and a true American hero, astronaut Buzz Aldrin. 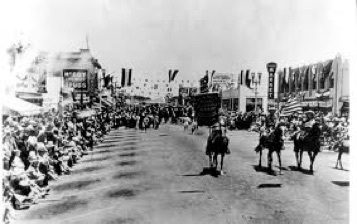 The best legend goes that during his presidency, Franklin Delano Roosevelt’s entourage was on its way through town, headed for San Diego, as the parade was going on. Quick-thinking parade organizers persuaded them take a slow pass along the parade route, to the delight of those gathered to watch. The Parade marked its centennial in 2004 by bringing the fireworks back to the beach (from its former location at Huntington Beach High School), which drew 150,000 onlookers. This year’s fireworks 23-minute spectacular, with a total of 1,300 rounds of fireworks – 500 of them during the finale in the last 40 seconds of the show — is expected to attract twice that many.